Get your grill on in spectacular style this summer. 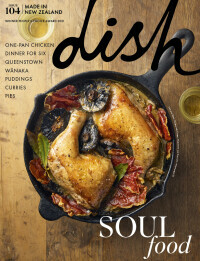 Dish’s February/March issue celebrates the season of lazy barbecues, zesty salads and the art of summer entertaining. From casual bites to share among friends to popular summer time fare, we've collated dozens of delicious recipes perfect for those balmy evenings. Our food editor Claire Aldous fires up the barbecue for flavour-packed bites to serve hot off the grill, from Korean Chilli Pork Steaks and Italian-style ribs, to the holy grail of beef burgers. Cool down with an icy, fruit-filled treat and try your hand at our homemade popsicles. Take your tastebuds on a trip around the Pacific with Sarah Tuck, as she showcases the best on offer in Fiji. For the brew lover, turn to our panel's pick of New Zealand's top smoked and sour beers - drink matches that are just right for barbecue season. The new issue also celebrates the unsung community heroes among us, with the spotlight on the team behind Auckland cafe, Crave. While your summer holiday may be nearing its natural end, the fresh summer menu and bountiful seasonal produce are just getting started. Find issue #70 in stores now. Buy a 12-month print subscription to Dish and you'll be in the draw to win one of 13 Le Creuset Stoneware Heritage Covered Oval Dishes, worth $179 each.